Dr. Magdy Moussa, Professor of Ophthalmology at Tanta University, Egypt, describes the advantages of Swept Source OCT technology and the highlights of the recent ISSOCT meeting. Dr. Pearse Keane, of Moorfields Eye Hospital, London, UK, discusses the reasons for upgrading to Swept Source OCT technology and the rapid advancements in OCT Angiography technology. Prof. Dr. José María Ruiz Moreno of the Universidad de Castilla-La Mancha, discusses the impact of Swept Source OCT technology and OCT Angiography on his research. Dr. Netan Choudhry, Director of Vitreoretinal Surgery at Herzig Eye Institute, discusses the advantages of the Triton* and the reasons to upgrade from Spectral Domain to Swept Source OCT technology. Q#1: How long have you been using the Topcon Swept Source OCT, the DRI OCT Triton*, and how many patients have you imaged with it? Q#2: Do you think other doctors should consider upgrading their Spectral Domain OCT to the Swept Source OCT system? Q#3: What will be your takeaway message from the ISSOCT meeting? Q#4: What do you think of the ISSOCT conference so far? What will be your takeaway message from this meeting? Q#5: What is your experience of Swept Source OCT compared to Spectral Domain OCT in scanning through media opacities? Q#6: What is the impact of Swept Source OCT and the longer wavelength on your research of the choroidal physiology and pathophysiology? Q#7: How do you think that these technologies will affect how you manage patients with diabetic retinopathy in the future? Q#8: What do you think of the combination Swept Source OCT and OCT angiography for your choroidal research? 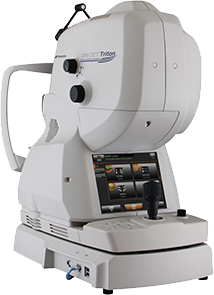 Q#9: How long have you been using the Topcon Swept Source OCT, the DRI OCT Triton*, and how many patients have you imaged with it? Q#10: Why do you think doctors should consider upgrading their SD OCT for the Topcon DRI Triton* Swept Source OCT?